This piece has already appeared on the NZ Herald Opinion page. My main concern here is to highlight that the legal market appears to be pretty well insulated from the illegal. I visited China for a research project on the ivory trade in January. It took two years of groundwork first. China is not an easy place to get data from – you just can’t drop in and start investigating. And, rather than gathering rumours and stories from the fringes of the legal market, which seems to be the case in many international media reports, my colleague and I got access to other parts of the supply chain. The evidence began pointing away from the legal market as a catalyst for the illegal trade of ivory. Ivory Carving- Southern Style. 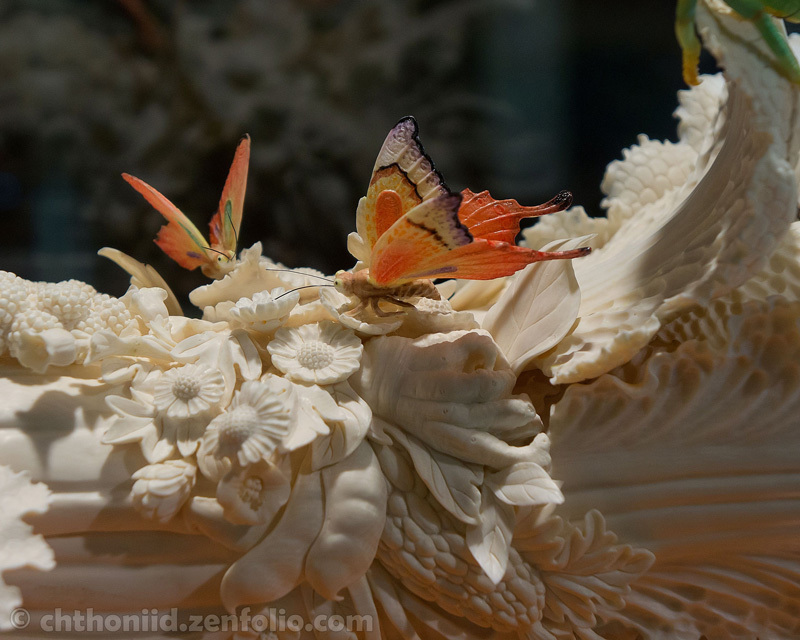 The butterflies are also carved from ivory. I’m a wildlife economist, but first a conservationist. Like all conservationists, I’m extremely concerned at the rate at which elephants are being poached in Africa, but it concerns me when I see inaccurate stories. You can’t fight the black market trade in wildlife unless you understand how it operates – and the legal ivory trade is not the right place to focus conservation efforts. In a major ivory factory in Beijing, we looked at the workstations. There were 16 in all. In 1990, before the CITES ban on international ivory sales, the factory had 800 staff, but the ban decimated the legal ivory carving industry in China. China legally purchased 62 tonnes from the existing ivory stockpile in 2008, and by that year there were only eight staff and one master carver left. Staff levels have since expanded to 16. Most were technicians in their third year of training. Depending on their complexity, pieces would take anywhere between two months and two years to complete. By weight, about 90 per cent of the registered ivory is made into unique pieces with specific photo-IDs. The scope of the problem of resale of small generic pieces is unknown, but the legal trade is simply unable to absorb the tonnes of ivory being smuggled from Africa. The registration system tracks raw ivory through to the final product and cross-checks each stage for weight gains. Factories and shops are inspected regularly and sometimes covertly, several times a year. Ivory prices depend on many variables, such as size and grade, the quality of the carving and the reputation of the carver. It’s impossible to detect claimed dramatic price rises for ivory. Prices are what we describe as very noisy. None of the suppliers we interviewed expect overall prices to rise. Other goods, like jade, are preferred for investment over ivory as they’re showing attractive price increases. The legal ivory system in China is a small industry, with a productive output strongly limited by the lack of qualified carvers. It’s subject to monitoring and inspections that make laundering risky. It’s not a competitive market, as entry is restricted and firm numbers are low. This suits the incumbent firms as it inflates their prices and their profits. They have no enthusiasm to expand output as this would cause prices to drop. The small size of the industry and the slow output cycle means they cannot absorb large volumes of ivory. The legal market caters to a clientele of informed, repeat customers after quality pieces, which distinguishes it from the illegal market where we saw generally cruder and smaller carvings which could be pumped out by less skilled carvers, items of less value to serious collectors. The ivory sale to China in 2008 put money back into elephant conservation in the four southern African countries. On-going trade may be sustained by natural deaths and culls in Africa. The legal market is insulated from the illegal market at several levels. Blaming the legal trade for elephant poaching is simplistic, wrong and a threat to the conservation gains the industry has yielded. It is also a perverse distraction because we need to focus on the real causes of poaching.